Immediate download of 9-track album in your choice of 320k mp3, FLAC, or just about any other format you could possibly desire. 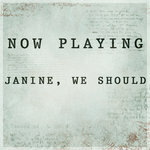 All songs include album art and lyrics. 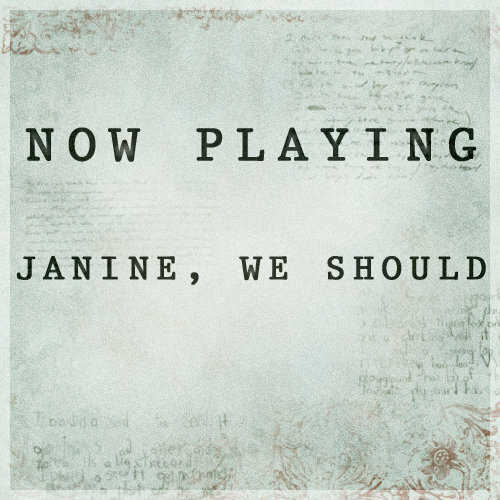 "Now Playing" is the Debut EP of the local indie alt band Janine, We Should. As the selective culmination of the first several months of their existence as a band, the album is a mix of songs and compositions pulled from the life experiences of the members themselves. From the hopeful reassurances of "to Believe" to the abandonment of "Picture Show" to the triumphant anthem of "Breathe", the album is a circular work echoing the nature of the theatre of life itself. Album Highlights: "All I Know", "Breathe"
oh, hold on tight dear, now more than ever. they'll try to tear us apart, but we know better. don't let go dear -- i know it might seem slow. but we'll change the world with this love, and then they'll know. oh, hold on tight dear. now, more than ever, we must sing to believe we can sing away this sad, sad mockery. hold on tight dear; they can't silence our voices. we must sing. i'm counting the stars in your eyes, but there's a few that i know i won't find. it kills me with each one that dies. i'm sorry that i've been so blind. so i'll do all i know to do; yes, i'll keep on loving you. and if that's not enough, i'm sure i'll find more. i might not have much left to bring, so on one thing i'll have to rely. i promised you better, i promised you more, so just give me one last chance to try. and there'll be more. and we'll be more, more than ever before. high on these wings we'll soar farther than ever before. standing at the top and looking down, the water's deep but i won't let you drown. as we fall the whole world fades around, and the only noise is our own hearts' beating sound. as the water breaks our fall, i know we've seen it all. they'll tell us that the world is burning down, that these endless wars are crushing it with their weight. but we'll show them that there's hope here after all, and we'll give this one more run before our fate. the clock strikes 2 am without a sound. the tv's on but we couldn't give a care. the scientist and the preacher say it's coming 'round, but here with you in my arms i know that fate wouldn't dare. just looking in your eyes, there's something i'll realize. and as the water breaks our fall, i know we've been through it all. well my heart will sleep tonight on its bed, silk sheets stained in red. it's never seemed as calm as on these waves, casting off away. even the turning leaves turn no more, laid on white carpets' floor. don't worry, silver fire: put out your flame, and take in all your blame. oh, rest in peace; sleep without a stir, and know that you won't be needed here for a while. do i walk the tragic trail laced with hope -- the gentle rising slope? and as the boulder falls, i'd swear again that this would be the end. and those times i've called before, remember them no more. and know that you won't be needed here for a while. i guess some things i do are simply out of my control, 'cause it's the sixth time this week i'm at the Picture Show. and even though i know i can't find the sight of you, i somehow still find myself buying tickets for two. to my left i saved your favorite seat in the back row, and my eyes were for the door for you for the whole show. and as the credits rolled, a name caught my eye, for on that screen were the names who put together my life. and with a half-empty cup in my hand i felt like a fool, 'cause i knew the only name on that screen would be yours. and when we speak, i can barely remember that light -- the faintest glimmer in your eyes when things were still alright. it's not so long ago that waking up was living a dream, but now the only complete life i see is on the movie screen. well, sixteen stubs lie untorn on my desk. my drive-in tears find no shoulder with to rest. so i sit here waiting for the scene where my arms reached out to more than just a seat. hush, don't say anymore -- your words are useless here. your touch says it all. so breathe, and cry now no more. your tears aren't welcome here, displaced by this song. stop, and don't let it fade. we've come so far away from those lonely nights. stop, please don't let go. the future's dark ahead, but our time is now. the dawn's so far away, but we can fly today. so take these shaking hands and know you're not alone. we're joined, forever bound. we're lost together found. so breathe and finally see: your tears are welcome here, they're singing this song.